Dozens of volunteers from around the region gathered at the Town Center to make kits for teens with cancer and other illnesses. 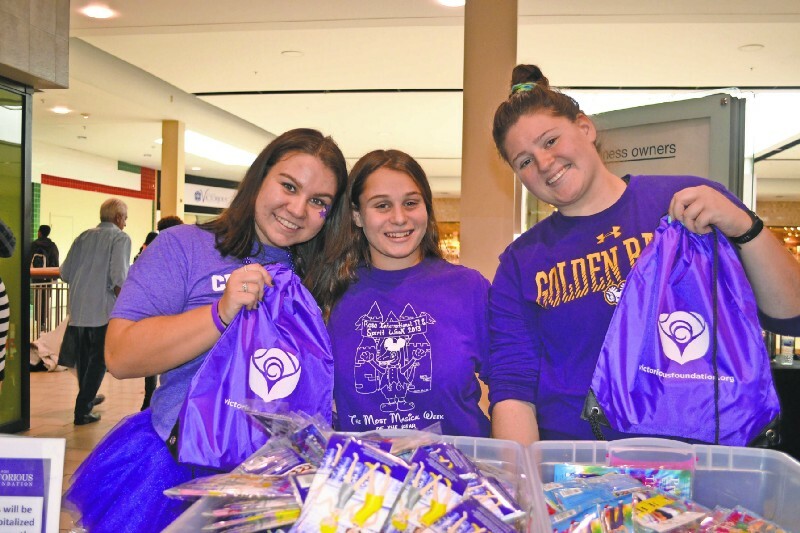 Jess Kinser, a student of Eastern Regional, Naomi Abrams and Julia Bonomo, also a student of Eastern Regional, stuff bags for teens with cancer as part of Alicia Rose Victorious Foundation’s held its 10th annual MLK Day of Service at the Voorhees Town Center. Purple tutus, bandanas and pillows populated the second floor of the Voorhees Town Center this week. The colorful scene scattered with lip balms, journals and bracelets was part of a greater effort to raise awareness, provide support and administer funds for the benefit of hospitalized children with cancer and other life-threatening diseases. For the 10th annual year, the Voorhees-based Alicia Rose Victorious Foundation, hosted its MLK Day of Service, which happens to coincide with Teen Cancer Awareness Week — a national resolution championed by the ARVF and eventually unanimously passed by the U.S. Senate in 2013. This year marked the event’s largest turnout to date. The organization, founded in 2002, has dedicated the last 16 years to a specific population of patients with cancer and other life-threatening illness — adolescents. Before her daughter passed away in 2002, DiNatale noticed the lack of recreational, physical and emotional resources geared toward preteens and teens, as she recalls predominately tiny furniture and juvenile activities provided for patients at the Children’s Hospital of Philadelphia. During the event, dozens of volunteers formed a large line that weaved around the second floor of the mall, forming a massive assembly line to create the kits. From a deck of cards to Tic Tacs, purple drawstring bags and Bandana Pillows were filled with goodies. The ARVF’s goal was to create 1,000 kits by the end of the service day. Along with other events planned for Teen Cancer Awareness Week, the kits will be delivered to hospitalized children nationwide, including local places such as Children’s Hospital of Philadelphia, Cooper Children’s, Nemours Alfred I. DuPont, St. Christopher’s Hospital for Children and Virtua. Considering the drive of the volunteers, reaching 1,000 kits did not appear impossible. From students to parents with similar experiences as DiNatale, everyone was there for a common purpose. “Our son was 11 years old when he was diagnosed. And when you go to the hospital, everything is for little kids,” said Kamala Allen, a volunteer whose son passed from cancer in March of last year. She is also the co-founder of the Mason Chandler Allen Memorial Foundation, which is named in her son’s honor. “As a preteen or teen, there’s not a lot for you in the hospital. Because that was his experience, we really want to support other teens who have long stays in the hospital for treatment,” she said. One in 285 children in the U.S. will be diagnosed with cancer before the age of 20, according to the American Cancer Society. There are approximately 388,000 survivors of childhood and adolescent cancer, and two-thirds of that demographic will need continued treatment for a chronic condition, according to the ARVF. For some folks, these facts are enough of a reason to come back each and every year. Source article published by The Voorhees Sun.